Hello! My name is Kristy Gonzalez. 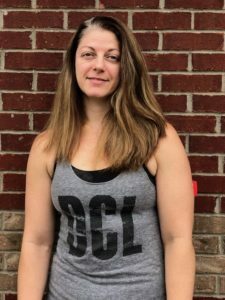 I am a Crossfit Level 1 Trainer where I work with CrossFit Dunbar Cave Lab to help our community members achieve their health and fitness goals. I believe that CrossFit is an effective fitness methodology not only because of the scalability of CrossFit, which permits anyone, at any level of fitness to participate but because of the unique atmosphere which drives the athletes to become the most supportive community in the fitness industry. Since early 2015, I have worked at CrossFit Dunbar Cave Lab and have assisted numerous athletes in reaching their personal and professional fitness goals. I have attended weightlifting seminars in both Europe and the US, and have previously completed the CrossFit Judges Course as well as the CrossFit Scaling Course.